We get it. Date night is fast approaching, and you want to do something fun. You find yourself frantically searching for interesting things to do, only to draw a blank. Stop sweating it and wipe your brow because you’ve done the legwork for you. Since 1914, The Apollo Theatre has been a mainstay in the world of rhythm and blues. Step inside and let yourself be swept away by the smooth beats of upcoming jazz artists in the Big Apple. Take a tour of the Philharmonic’s home. Lincoln Center is a cultural mecca for dance, film, music and theatre from around the world. With acoustics fit for a king, the 2,700-seat hall makes the price of the tickets worthwhile. Hurricane Sandy may have left its mark, but NYC came back even stronger. Catch the subway down to Seaport and enjoy what this quaint quarter has to offer. Seaport is home to some of the oldest architecture in the NYC, including buildings from the 19th century. Grab a bite at one of the outdoor restaurants or just sit and watch the sailboats go by. Manhattan isn’t the only borough with posh brownstones and beautiful backdrops. Brooklyn Heights is known for its swoon-worthy promenade along the East River. If dancing in a costume is your thing, HOY in Bushwick has just what the doctor ordered. Originally a spot for aerialists to perfect their craft, House of Yes is now the place to see and be seen. Dress to impress and get ready to be pleasantly surprised! Bookworms will love the Strand. Founded in 1927, Strand is one of the most beloved bookstores in town. With over 2.5 million books in stock, it’s impossible to buy just one. If you’re a bargain hunter, make sure you check out their selection on the third floor. who says you can’t have dessert for dinner? Ample Hills Creamery throughout Gotham City, where you can double and even triple scoop with your cutie. From Midtown to Little Italy, there’s always a party going on! Street fairs are a staple on summer in Empire City, so use this guide to keep your calendar current. Before the next heatwaves sets in, it might be a good idea to know where you can cool down. New York has tons of places where you can take a dip and beat the summer heat. Take note of the bathing suit and bathing cap policies. If you forget, you may not be allowed to wade in the water. What do you get when you combine green grass and a jazz quartet? Probably one of the best dates ever, that’s what. NYC is known for over-the-top parties, so use this link to find when the next one is happening. Remember when kickball was the best thing ever? Take a trip down memory lane at Chelsea Pier and play a rousing game of kickball. Maybe Sunday really is the ultimate fun day. Dedicated a national monument in 1924, this gal gets better looking with each passing year. The Statue of Liberty is the true symbol of life, liberty and freedom. Having brunch is a way of life in Gotham. Uptown, downtown and everywhere in between, the choices are endless, often leaving one totally perplexed. Thankfully, we found a great list of the top spots to nosh right before noon. Spend the afternoon on a 172-acre island in the heart of the Big Apple. Governor’s Island is only 800 meters away from Lower Manhattan, making it super accessible by ferry. Filled with fun activities and learning programs, you’ll be glad you came. Film lovers unite! Catch a flick on a New York rooftop! Grab your better half and ascend into a viewing eutopia underneath the stars. The Rooftop Cinema Club offers cult classics to eclectic Indie films. 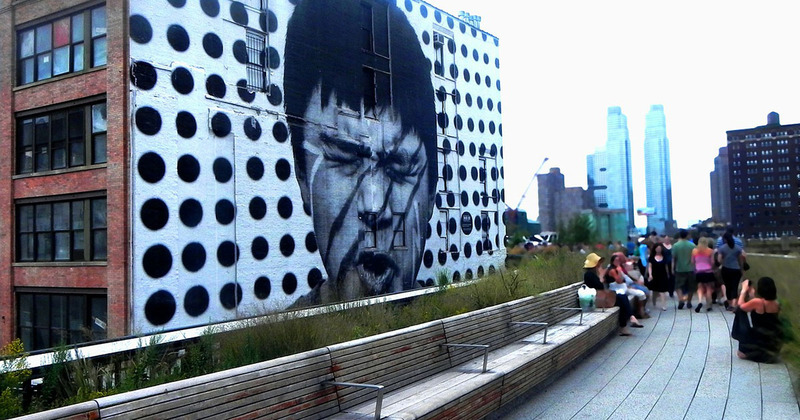 Escape the bustling streets and relax on a wooden chaise at High Line. Once a railroad, this peaceful oasis conveniently located right in the heart of Midtown. Fun fact: High Line also hosts educational activities, so be sure to check those out too! If you’re short on cash but still want to spend time with your honey, why not stroll across the Brooklyn Bridge? Beautiful night or day, you can walk, run and even bike your way across the bridge. If you’re looking for a little romance, wait until sunset to make the trek. With summer right around the corner, what could better than dining al fresco? Fill a picnic basket, grab a blanket and pick of these seven dope spots to watch the world go by in Central Park. Head to the Top of the Rock for breathtaking views of the city. From 70 flights up, it’s the perfect place for a romantic excursion, day or night. Gotham City has a lot more to offer than soaring skyscrapers and overly priced coffee. Just a few subway stops away from the center lies a magical place where you can make some new friends. Home to hundreds of species of mammals, Bronx Zoo is as New York as it gets. If cherry blossoms make your heart sing, hop over to the Brooklyn Botanical Garden and breathe deep. The heavenly scent of cherry blossoms will sweep and your better half off your feet. If downhome cooking makes you feel all warm and cozy, head to Chelsea Market for buttery biscuits. This urban food court puts Paula Dean to shame! Just don’t forget to ask for extra gravy! Where: 11 West 53 St.
Visit one of the most famous museums in the world before it even opens! Moma now offers VIP tours for those who want to live like a boss. No waiting in line, no annoying tourists snapping photos in your face. It doesn’t get any better than that! Sure, exploring the city on foot is exciting, but what if you could have a bird’s-eye view? Grab your honey and take an airplane tour of the city! Majestic views of Manhattan’s skyline are the perfect way to end a date! So there you have it. Our list of 25 things to do that don’t include a big, red bus. Enjoy and don’t forget to check back for more lists to things to do in the Big Apple!